February 2018 World of Gymnastics magazine now online! The new Individual Trampoline Gymnastics World champion Tatsiana Piatrenia (BLR) is pictured on the cover of the February issue of World of Gymnastics magazine, the digital version of which can be read in English and French. Inside, readers will find a detailed review of the Trampoline Worlds in Sofia, Bulgaria, where Gao Lei (CHN) successfully defended his title and 36-year old Piatrenia clinched her first individual World gold after an international career spanning 19 years. 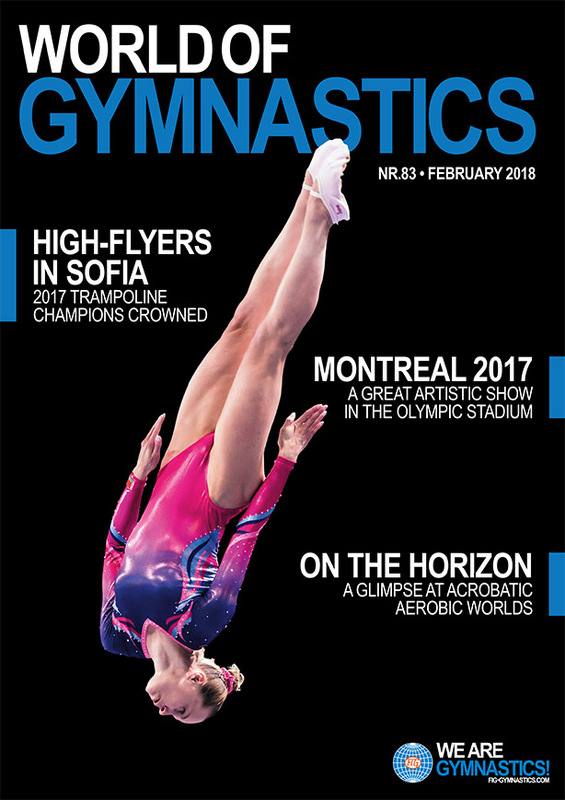 The latest issue also contains a report from the Artistic Worlds in Montreal, Canada, where Kohei Uchimura’s (JPN) incredible series of victories came to an end with an injury, as China’s Xiao Ruoteng took the men’s All-around crown and Morgan Hurd became the 12th woman to win All-around gold at a Worlds or Olympics for the United States. Also included in the magazine is a preview of the Acrobatic and Aerobic Gymnastics World Championships that will take place respectively in April in Antwerp, Belgium, and in June in Guimarães, Portugal.